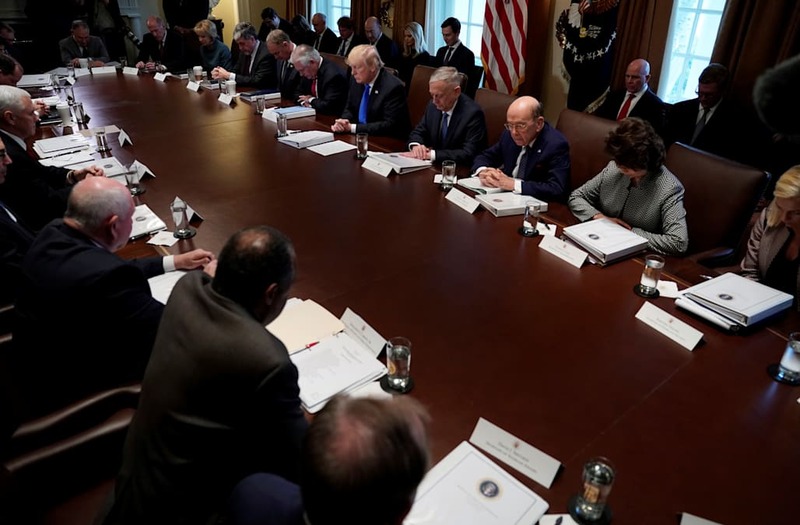 President Donald Trump asked Ben Carson, the secretary of Housing and Urban Development, to lead a prayer during a Cabinet meeting at the White House. Trump said the reporters in the room needed the prayer more than he did. Carson thanked God for the tax bill and prayed for unity in Congress and the country. President Donald Trump on Wednesday asked Ben Carson, the secretary of Housing and Urban Development, to lead a prayer during a White House Cabinet meeting. Trump, after praising the forthcoming passage of the GOP tax legislation, turned the microphone over to Carson and told reporters they could stay for the prayer because they needed it more than he did. “You need the prayer more than I do I think, you may be the only ones," Trump told members of the press. "Maybe a good solid prayer and they’ll be honest. Is that possible?" U.S. President Donald Trump celebrates with Vice President Mike Pence and Congressional Republicans after the U.S. Congress passed sweeping tax overhaul legislation on the South Lawn of the White House in Washington, U.S., December 20, 2017. U.S. President Donald Trump listens to Senate Finance Committee Chairman Orrin Hatch (R-UT) as they celebrate with Congressional Republicans after the U.S. Congress passed sweeping tax overhaul legislation on the South Lawn of the White House in Washington, U.S., December 20, 2017. U.S. Treasury Secretary Steven Mnuchin stands with Chairman on the National Economic Advisory Gary Cohn and Commerce Secretary Wilbur Ross before President Donald Trump celebrated with Congressional Republicans after the U.S. Congress passed sweeping tax overhaul legislation, on the South Lawn of the White House in Washington, U.S., December 20, 2017. U.S. President Donald Trump speaks flanked by Vice President Mike Pence, U.S. Rep Don Young, Speaker of the House Paul Ryan, U.S. Senator Dean Heller and Senator Tim Scott as he celebrates with Congressional Republicans after the U.S. Congress passed sweeping tax overhaul legislation, on the South Lawn of the White House in Washington, U.S., December 20, 2017. Ivanka Trump talks with attendees at a White House event after the U.S. Congress passed sweeping tax overhaul legislation, on the South Lawn of the White House in Washington, U.S., December 20, 2017. House Speaker Paul Ryan (R-WI) and Sen. Dean Heller (R-NV) applaud U.S. President Donald Trump, as they celebrate passage of sweeping tax overhaul legislation on the South Lawn of the White House in Washington, U.S., December 20, 2017. U.S. President Donald Trump celebrates with Congressional Republicans after the U.S. Congress passed sweeping tax overhaul legislation on the South Lawn of the White House in Washington, U.S., December 20, 2017. U.S. Rep. John Culberson of Texas gives a thumbs up to U.S. President Donald Trump (bottom) as he stands with fellow Republican members of Congress as he celebrates after the U.S. Congress passed sweeping tax overhaul legislation, on the South Lawn of the White House in Washington, U.S., December 20, 2017. U.S. President Donald Trump celebrates with Congressional Republicans after the U.S. Congress passed sweeping tax overhaul legislation, on the South Lawn of the White House in Washington, U.S., December 20, 2017. U.S. President Donald Trump arrives prior to celebrating with Congressional Republicans after the U.S. Congress passed sweeping tax overhaul legislation on the South Lawn of the White House in Washington, U.S., December 20, 2017. U.S. President Donald Trump arrives with Vice President Mike Pence and House Speaker Paul Ryan prior to celebrating with Congressional Republicans after the U.S. Congress passed sweeping tax overhaul legislation on the South Lawn of the White House in Washington, U.S., December 20, 2017. Carson said he was grateful for the "unity" that allowed Congress to pass the tax bill. "We’re thankful for the unity in Congress that has presented an opportunity for our economy to expand so that we can fight the corrosive debt that has been destroying our future," Carson said. "And we hope that that unity will spread even beyond party lines, so that people recognize that we have a nation that is worth saving." Carson also made an apparent nod to a famous speech soon-to-be President Abraham Lincoln gave in 1858, saying that "nations divided against themselves cannot stand."